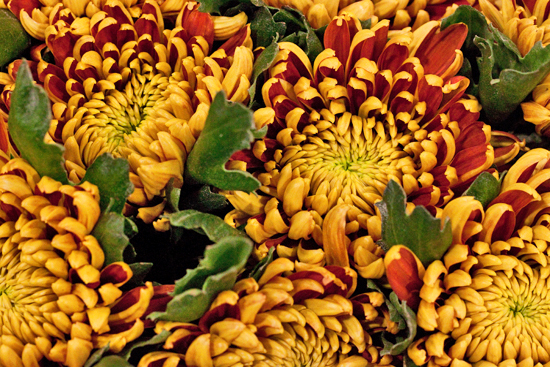 In this month's profile, we're going to take a look at the chrysanthemum…a well-known long-lasting flower with lots of different varieties, sizes and colours. 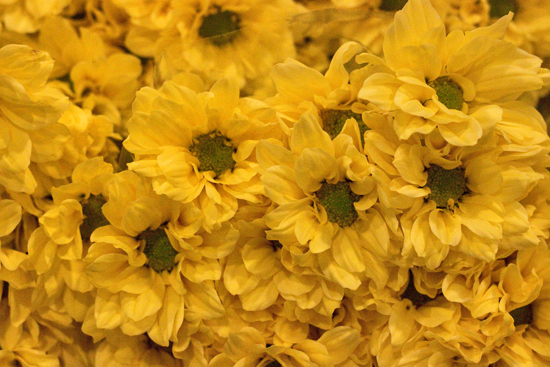 Chrysanthemums, sometimes called mums, chrysanths or even xanths, belong to the Asteraceae family. They get their name from the Greek words ‘chrysos’ which means gold and 'anthemon' which means flower. 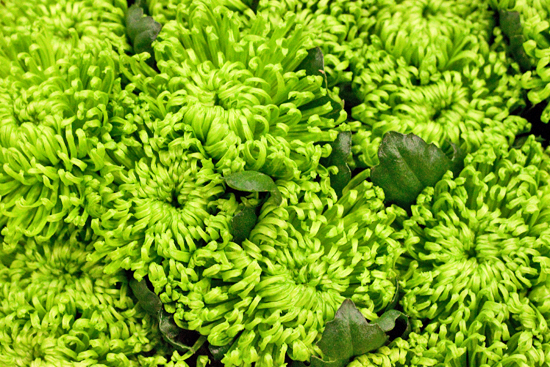 A staple flower at New Covent Garden Flower Market, many varieties of chrysanthemum are budget-friendly and very long-lasting. 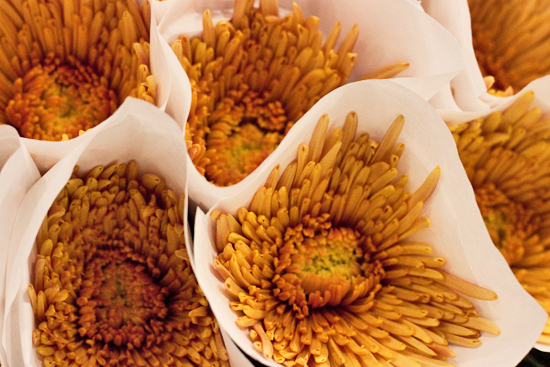 Some chrysanths are sold with nets or plastic bags on their flower heads, to protect their petals. 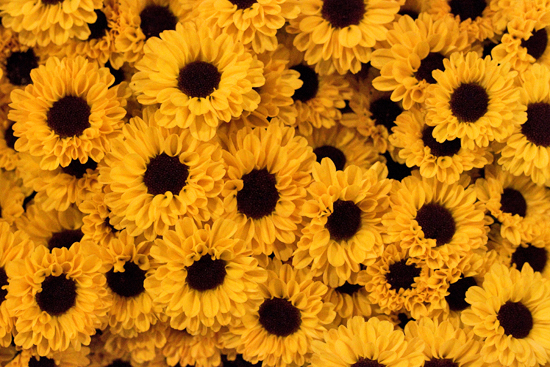 Most types of this cut flower are available all year round, apart from some varieties which are available in the autumn and winter months. 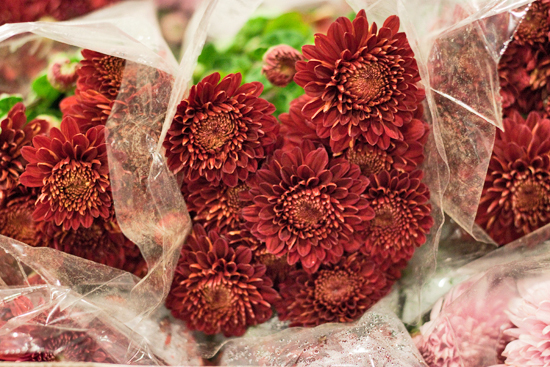 There are two main types of chrysanthemum at the Market: Single-Headed Bloom Chrysanthemums and Multi-Headed Spray Chrysanthemums. 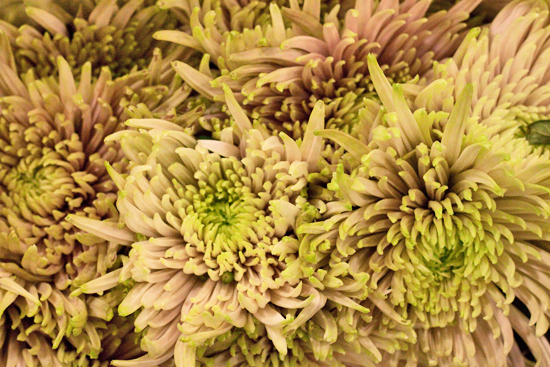 We'll take a look at these two main types of chrysanthemums in turn. Here are some examples of these different types. The flower shape in this category is almost perfectly globular in shape. 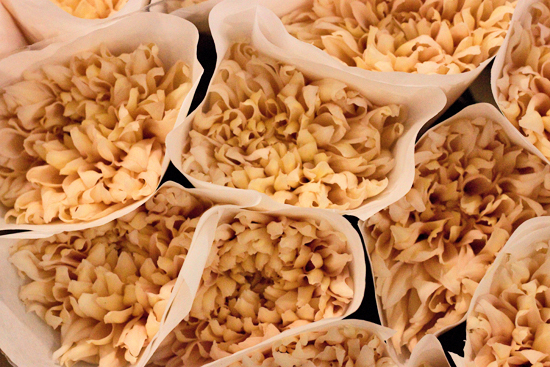 This category has large flower heads and their petals curve upwards creating a domed bloom. They're especially popular in the autumn and a great example is Tom Pearce. This category has spikey-looking flower heads and some good examples are in the Anastasia family. As suggested by the name, the flower heads in this category are button-shaped and the most commonly used varieties are the Stallion family. 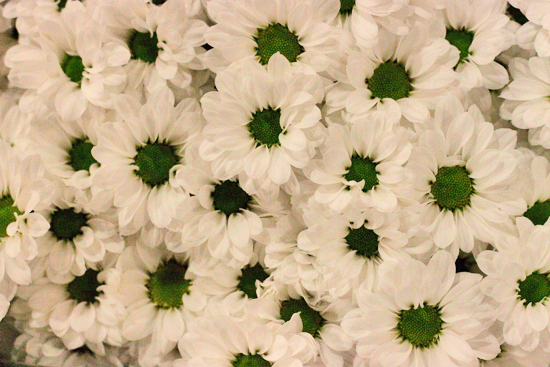 The flowers in this category look just like a daisy…a round centre surrounded by the petals. 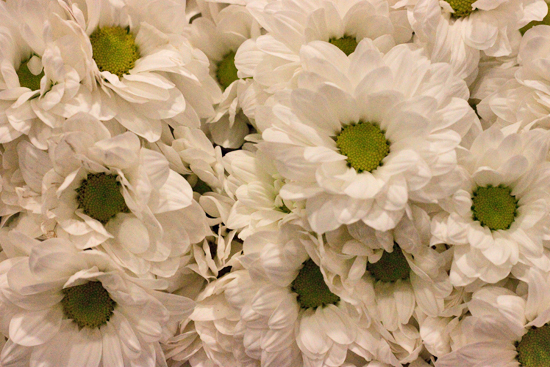 And the main daisy chrysanthemum is the Reagan family. In the UK, the main use of this category is for basing funeral designs. 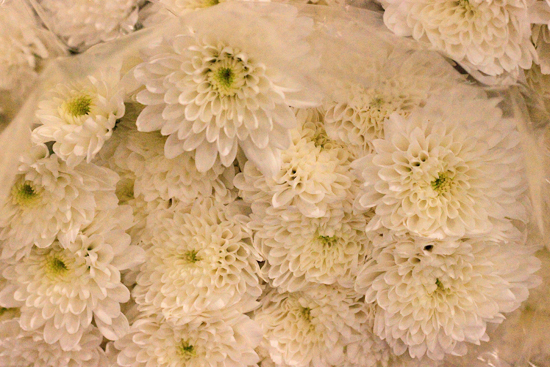 Good examples of double chrysanthemums are Arctic Queen and the Euro family. 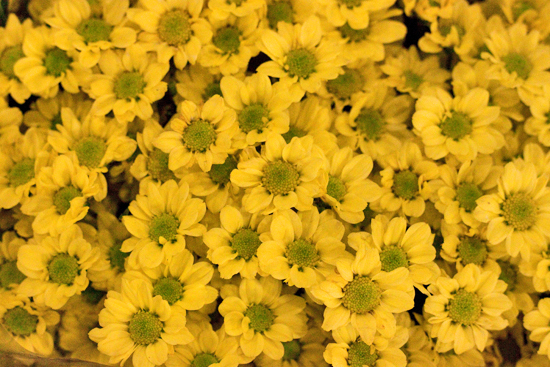 Santini are miniature chrysanthemums with shorter stems and smaller flowers heads than other spray chrysanths. This category has spikey-looking flower heads. Typical examples of this spider chrysanth include the Anastasia and Delianne families. 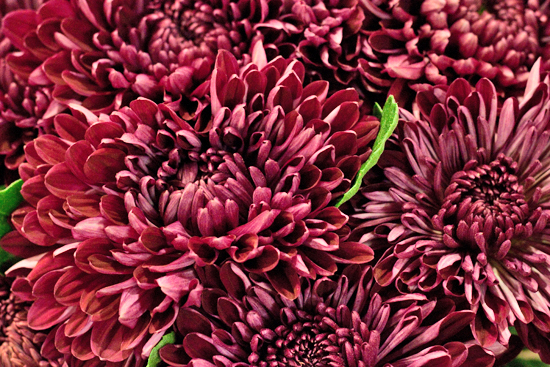 We couldn't take a look at chrysanthemums without checking out what's available from British growers. 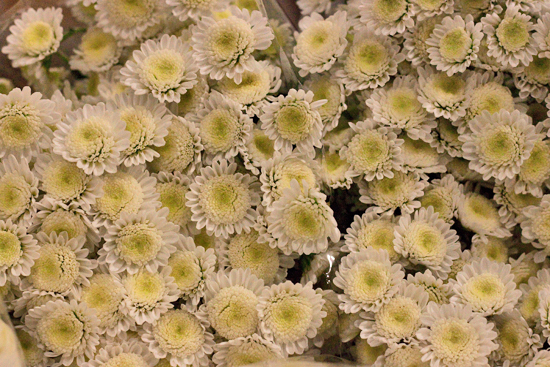 Pratley sell a range of outdoor grown chrysanthemums which they call a 'shaggy mix'. 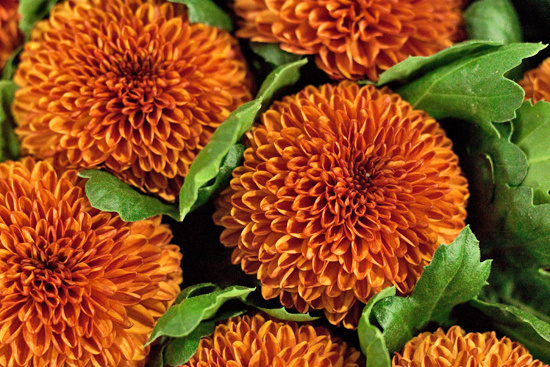 Other traders, including E Four Sales, sell British bloom chrysanths at this time of the year, but you need to be at the Market early as they get snapped up very quickly! 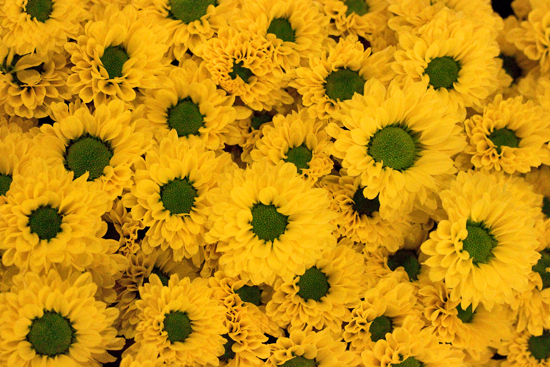 Most varieties of chrysanthemums come in bunches of five stems. However, Anastasias come in 10s and Santini come in bunches of 25 stems. The price per stem very much depends on the variety…with Santini costing around £6 a bunch to Tom Pearce being sold at around £10 a bunch. 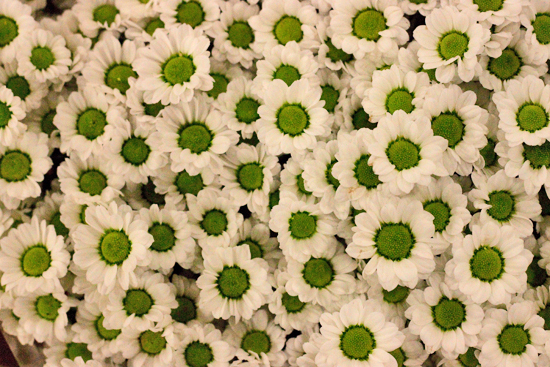 And British blooms are generally £10-£12 for a box of 30-40 stems. 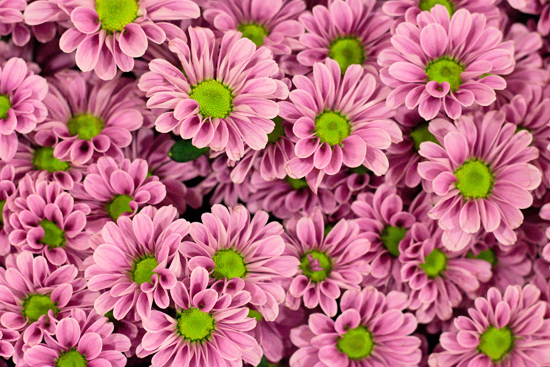 With regards to conditioning chrysanthemums…remove any excess foliage, cut the stems at a slant and place them in clean water. 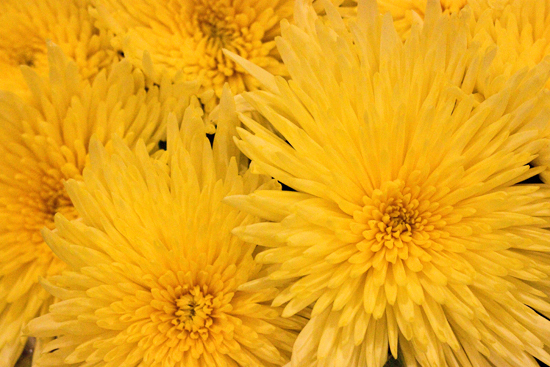 Graham at Zest Flowers says : "Chrysanthemums are very long-lasting and resilient flowers. 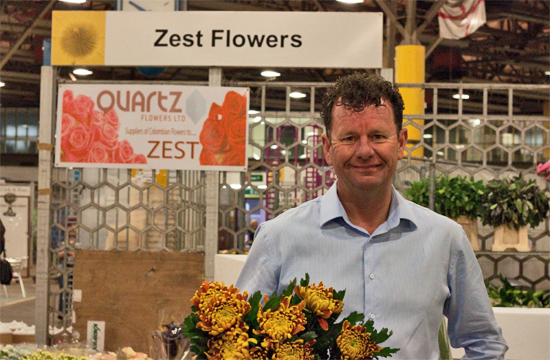 You'll generally find that Dutch chrysanthemums come in water and British ones in boxes." 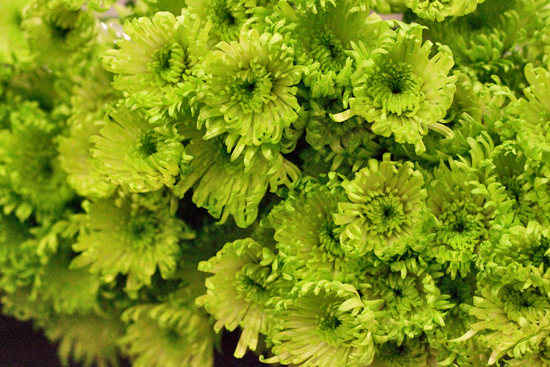 Most chrysanths have a vase life of 14-21 days. 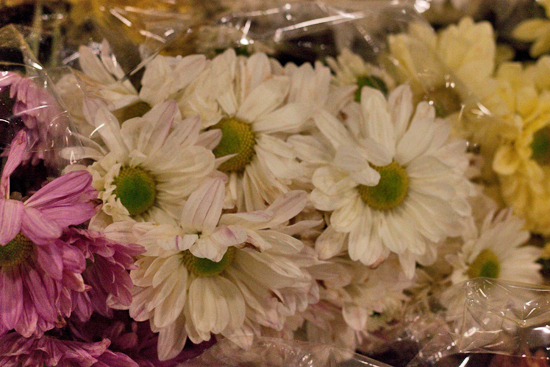 Be careful with bloom chrysanthemums, especially the incurve variety, as their heads are prone to shatter easily. 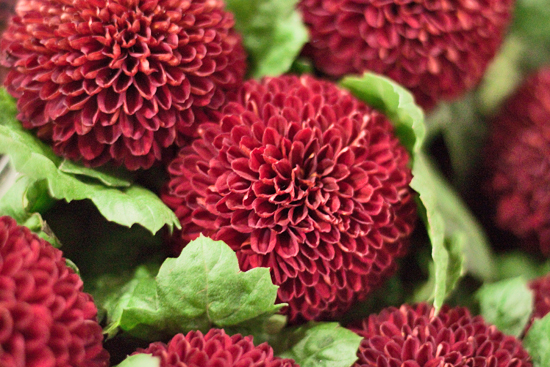 We've recently seen the revival of more traditional flowers, such as carnations and dahlias. 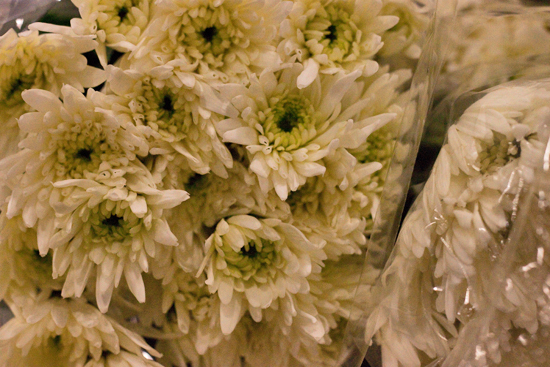 And now chrysanthemums are starting to become popular again. With fashion gaining more and more inspiration from Oriental influences, the chrysanthemum print is the new floral. And it's been seen on the Gucci, Prada and Marni catwalks this year. It's not just women's fashion though…chrysanthemum prints even appeared on the SS14 menswear runway recently for Dries Van Noten. 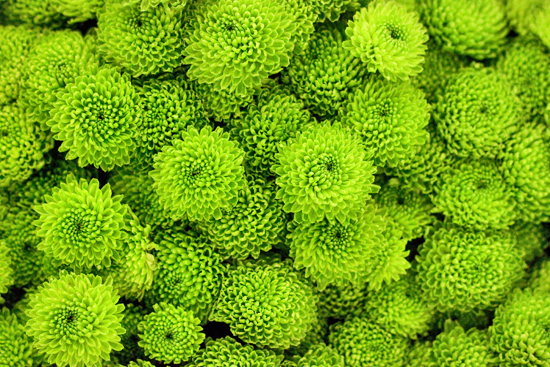 So, if you'd like to buy some of these on-trend long-lasting flowers, which are also great value for money, why not visit the Market soon to see the different types and wonderful colours available?